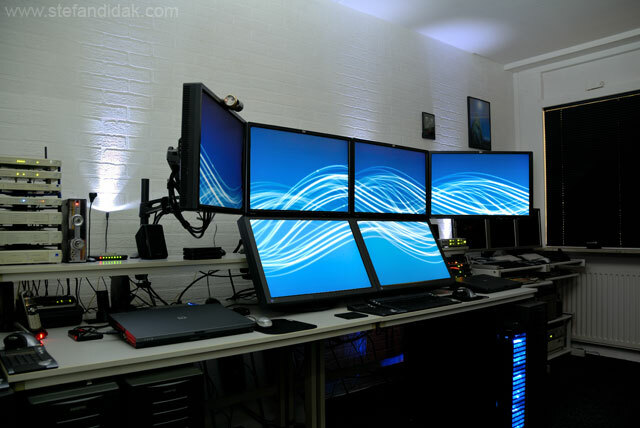 Are you looking for this multi-monitor home office setup? Well, Sorry!!! The previous home office has been improved upon. 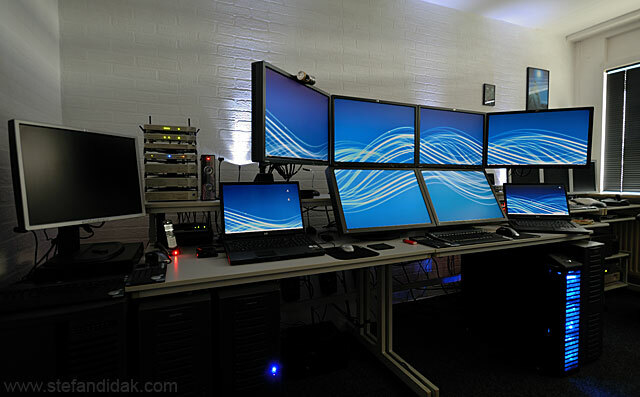 New workstations, upgraded servers, new monitors, new audio, new cables, new lots of stuff. 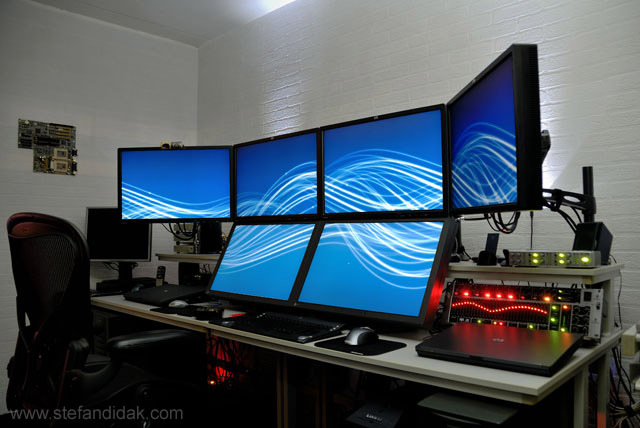 The images above show the PREVIOUS desktop with its 7 screens, 9 screens if the two laptops were used. The bricks, by the way, are not real bricks. They are brick textured foam wallpaper. Nice side effect is they dampen and absorb a lot of fan white noise. The new office setup is quite an improvement. 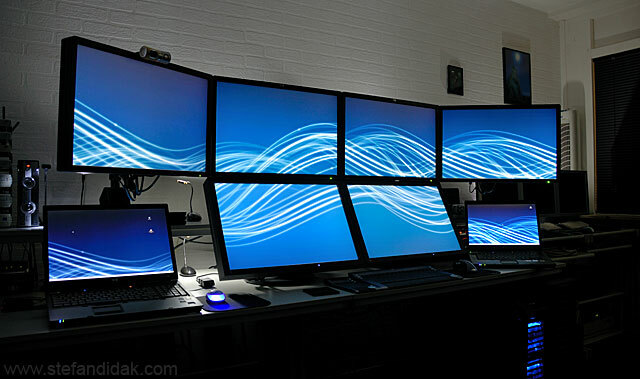 12 screens, yes, 12 monitors. Do I use them all at the same time? Not all the time, but often, yes! If you want to read all about the construction and setup, go ahead. 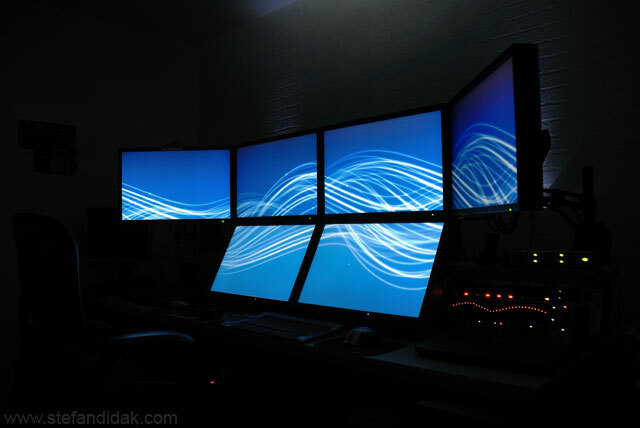 The six 24″ inch monitors that form the center of the workspace consist of two angled Eizo Flexscan S2431WH and four HP LP2475w monitors (yes, the S-IPS panels). 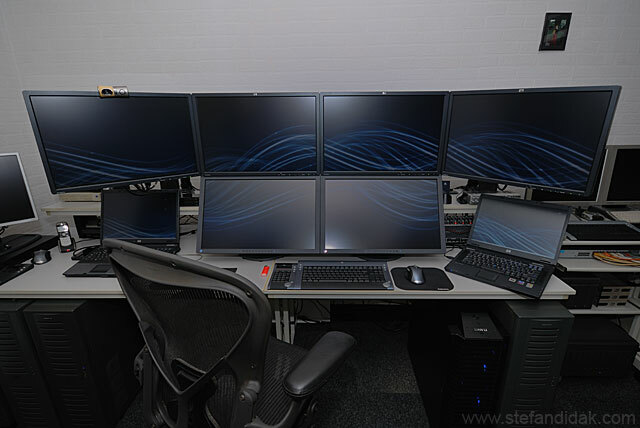 The four HP monitors are mounted on the extremely solid Ergotron LX arms. 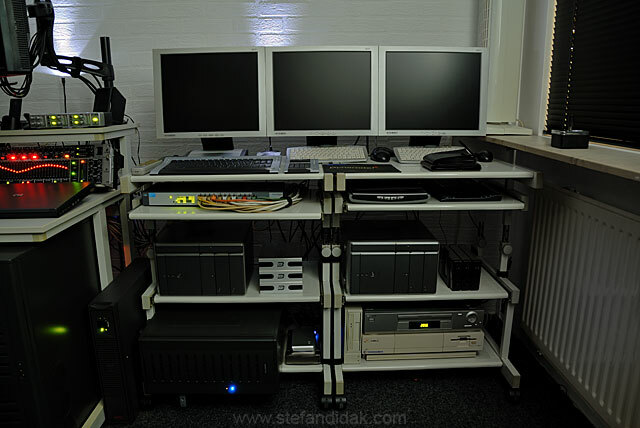 A wider shot of the main work area where I practice my taking-over-the-world-skills (or so some think!). 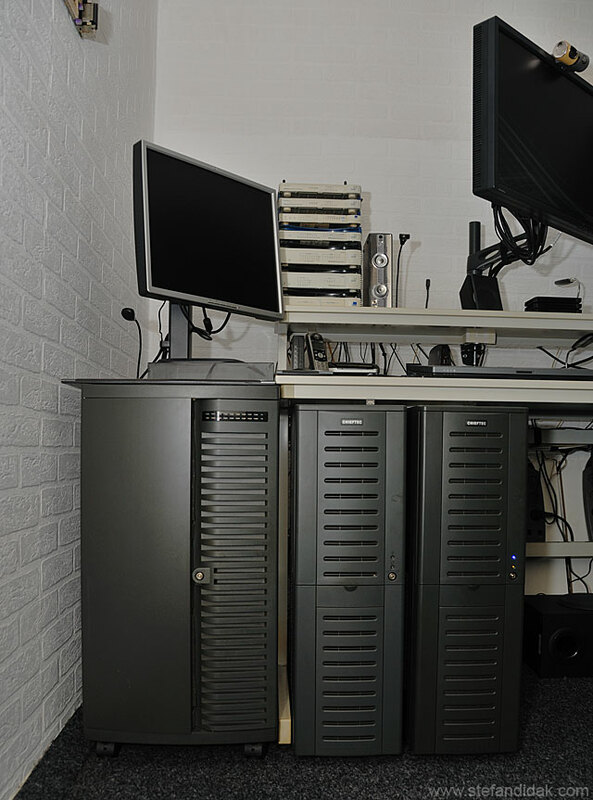 The monitor in corner there on the Arena Chieftec 2000B server case is a HP 19″ screen. And before you ask, yes I forgot to turn it on before I took the pictures. The other side of the main work area. 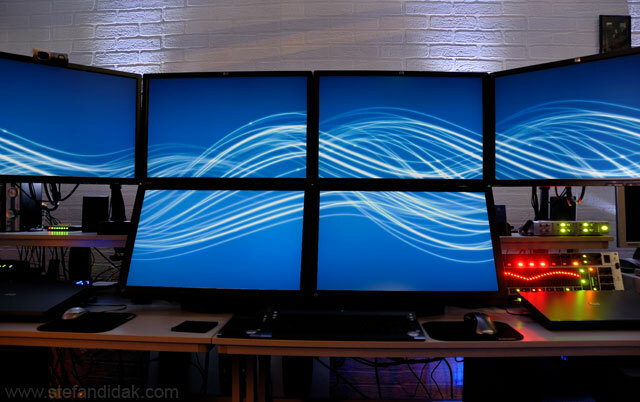 A few more systems and three 17″ Hyundai monitors. 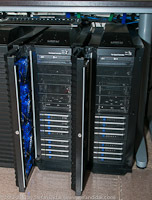 The system on its side is being powered by one of the APC Smart-UPS SC1500i. 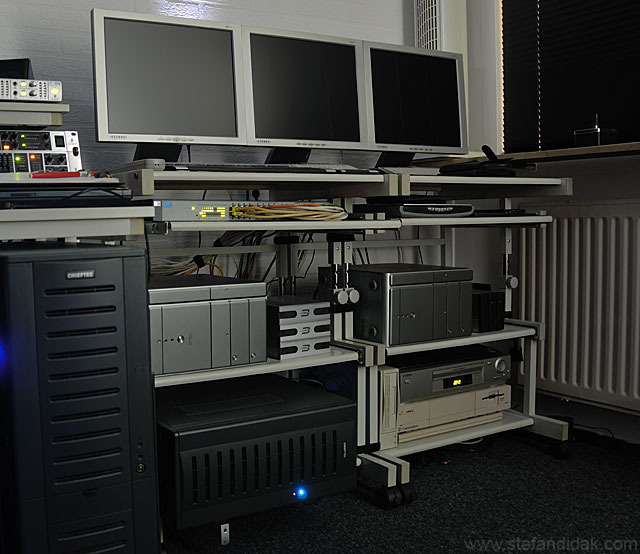 As you might notice from the PREVIOUS office setup, I got rid of a few things while at the same time relocating some older hardware to the storage cabinet where it’s functional but out of sight (and it saves space). 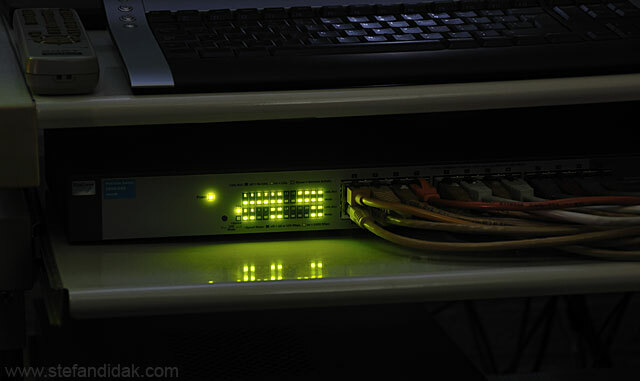 The new HP Procurve 1800-24G with 24 gigabit ports replaces most of the old 3COM STACK. Read about cable management and VELCRO if you want to know how to keep network cables tidy. 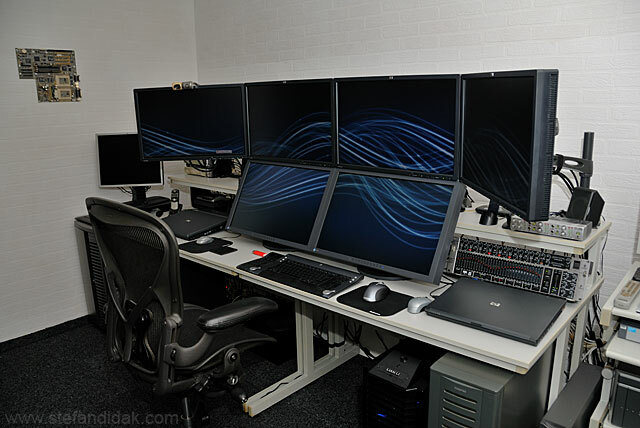 The newer workstations. An Intel Core 2 Quad Extreme QX9650 with 8 GB RAM in a Lian Li PC-P80. 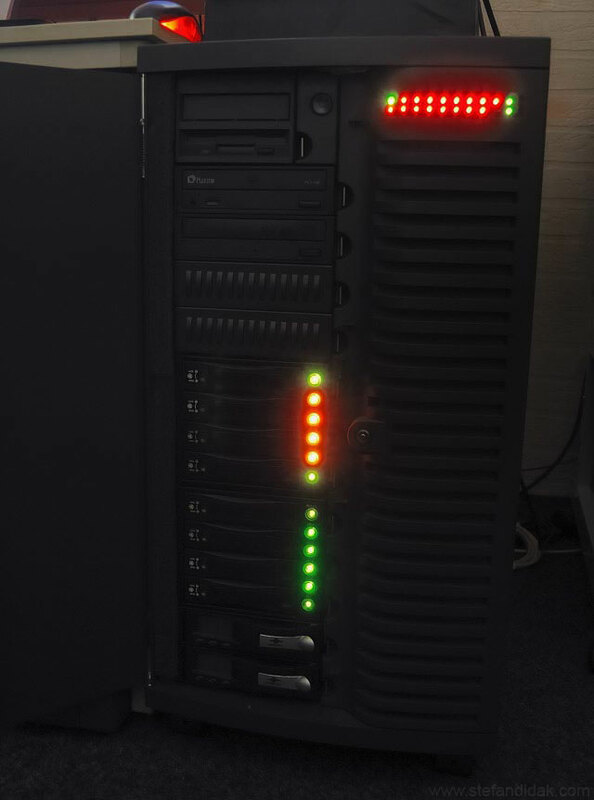 6.4 TB RAID-5 storage (300 GB WD Velociraptor x 8 and 1000 GB Spinpoint’s x 4) Running off an Adaptec 2820SA RAID controller hooked to Icy Dock MB454SPF backplanes. And an ASUS ENGTX280 HTDI supported by a 1000 Watt power supply to top it all off Next to it is ‘Krypton’, a slightly bigger workstation (see sidebar on the page for details). A picture showing ‘Boron’ along with ‘Hydrogen’ and ‘Isis’ and ‘Osiris’. If you are confused with the previous setup, don’t be. I renamed and re-assigned all the systems. 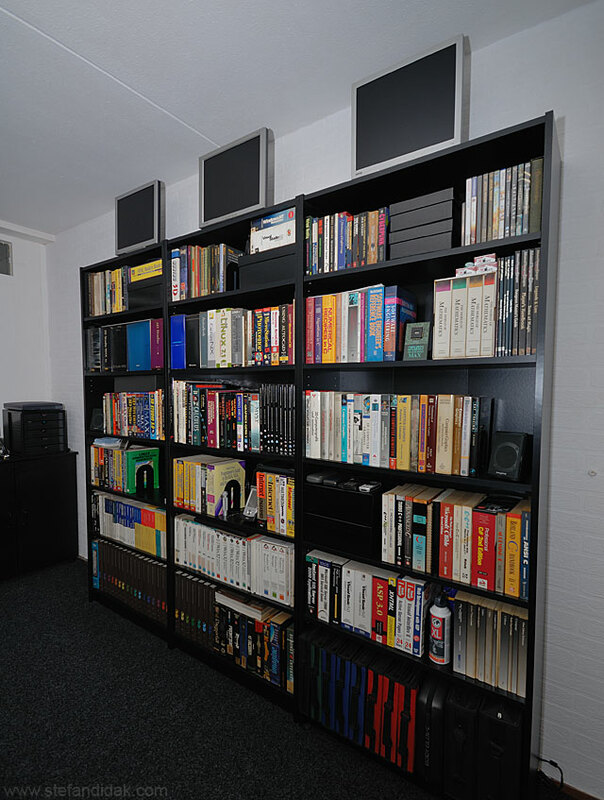 And if you are part of the older generation, yep, that’s an original Amiga 1000 down there. 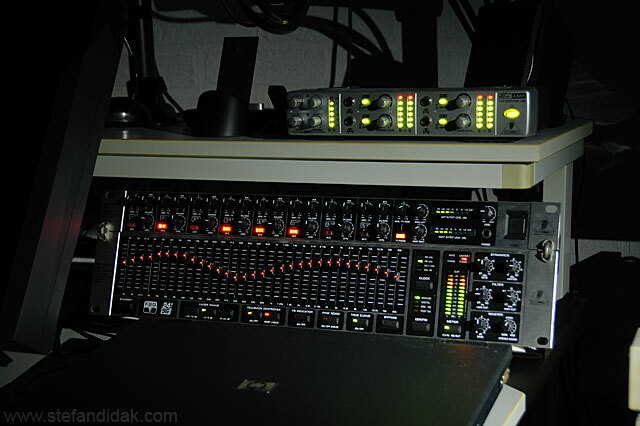 The new audio system by Behringer. What you are seeing here are the Behringer Eurorack Pro RX1602, the 16 channel line mixer that provides me a central place to control the volume of many of the workstatations while being able to hear all of them without having to go over the speakers. The box right below is is a Behringer DEQ1024 (Digital Stereo 31-Band 24-Bit/96 kHz Equalizer, Feedback Destroyer/Dynamics Processor) and the small box at the top is a Behringer MiniAmp AMP800 headphone amplifier with multiple inputs and outputs (since I have headphones on quite a lot). Tranquility in a sea of trademark blue. 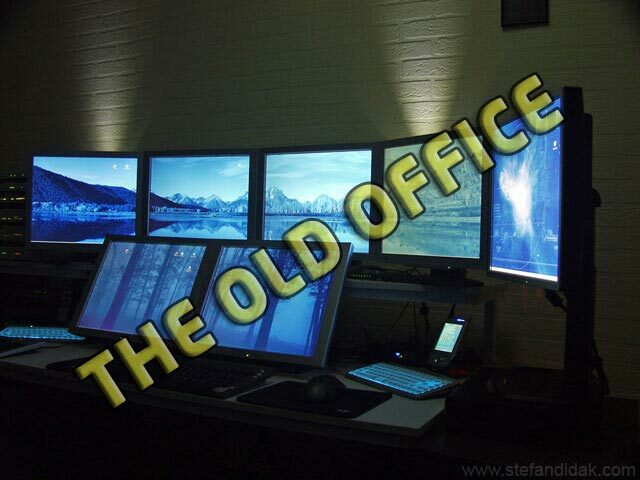 Many of you commented before on the old office and you will see it here again on the monitors, but no, there’s nothing wrong, it’s just an awkward angle I took the picture that makes it look dim. Most of the lighting in my Home Office is provided through LED lights. A combination of small desk lights with adapters and USB led lights of different types and shapes. By simply turning on more I can increase overall ambient lighting and ‘streaks’. Many of you asked me for daylight shots. Here is a good example of why that is a very difficult thing to do. Not because I am nocturnal but because the light from the monitors in combination with other light is extremely difficult to photograph correctly. Notice how the usual mess of cables is not as bad? 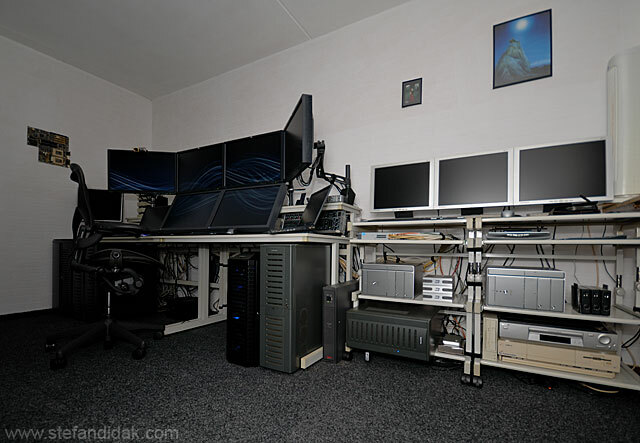 Of course, I should perhaps mention that before any system got connected and powered, it took me FOUR whole days (of 12-13 hours each) to lay the cables and conceal them. A wide angle view of the main desktop area. 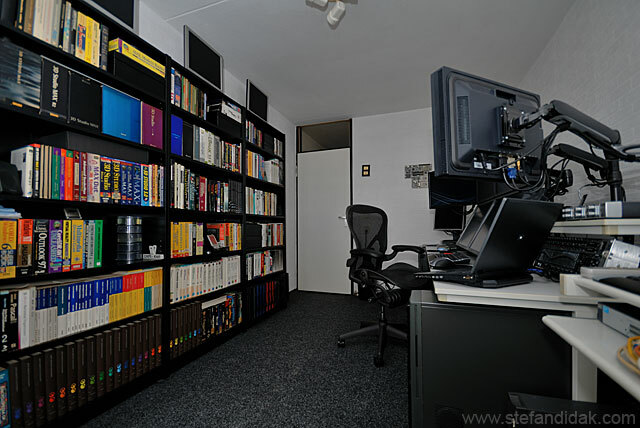 This was taken with a 10-20mm lens at 10mm because it is otherwise impossible to fit the width of the desk area in a single picture. Another wide angle shot with the 10-20mm lens at 10mm. 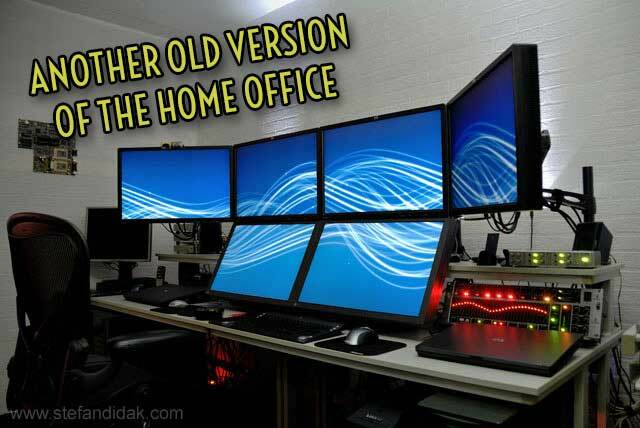 This shows a wider overview of the home office layout. As you can see, the actual space is not all that big. If there is a contest for most CPU cycles per square foot I’ll enter it… or maybe not. Another view of LED lights and LED lighting during the daytime. 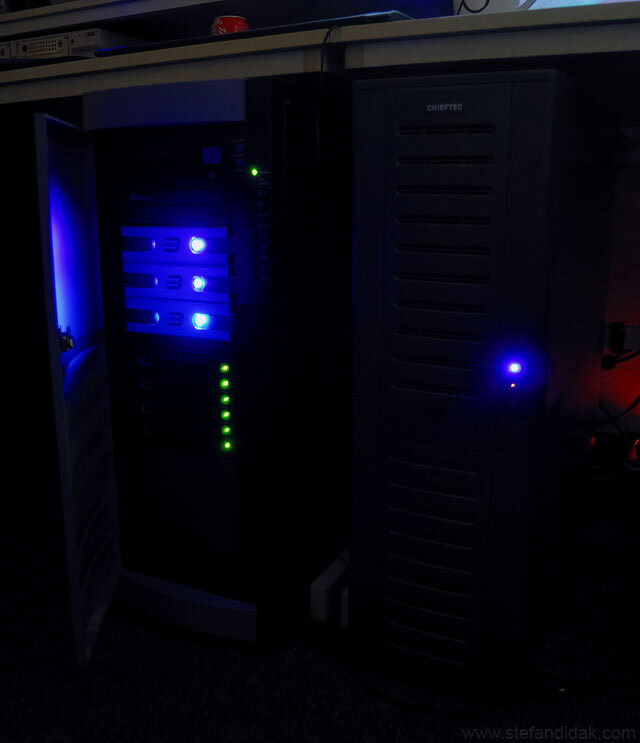 Oxygen (left), 2 x Dual Core AMD Opteron 275, Tyan Thunder K8WE, 8 GB RAM in a Procase Palo-Alto 501 9 TB RAID-5 storage and a whopping 42 Kg of weight! Neon (right) A simple Core 2 Quad Q6700, ASUS P5E WS Pro, 8 GB RAM in a Chieftec Bravo BH-01B-B-B. 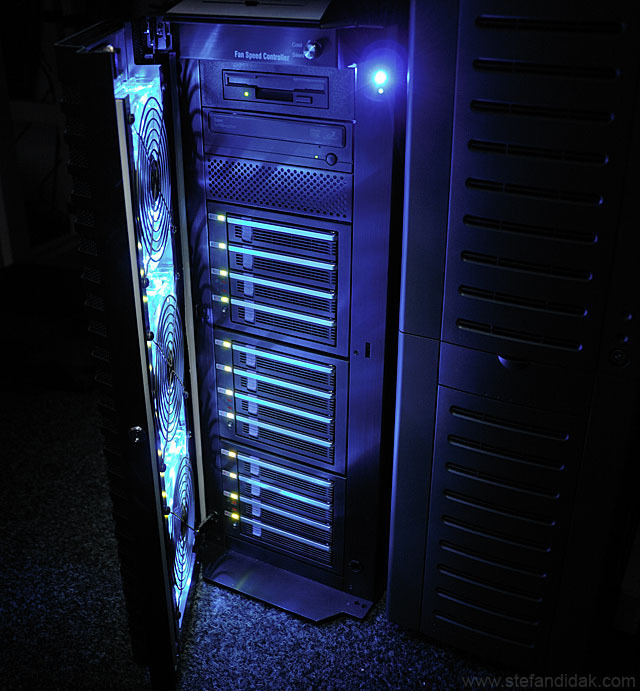 24TB of storage, 64GB RAM, Dual Xeon, hosting dozens of VM’s. On average will run 12-20 virtual machine OS guests. Yes, it’s true. And here’s the proof. 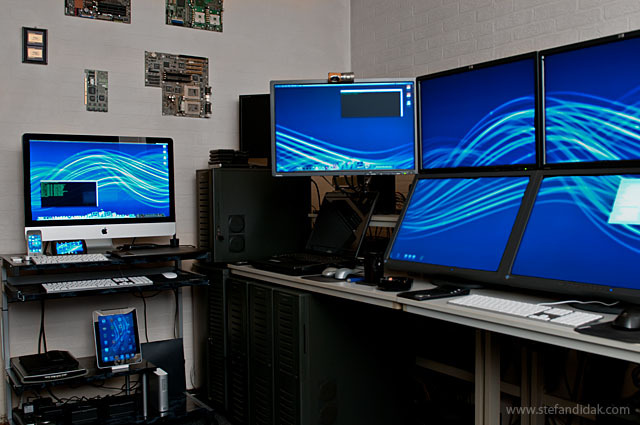 I added an Apple iMac 27 inch (i7 2.9Ghz 1TB HD, 1GB Radeon) to the office setup. I know this comes as a shock to many who have always thought I hated Mac’s. That said, don’t expect me to suddenly like or endorse Apple’s various insane policies, though! 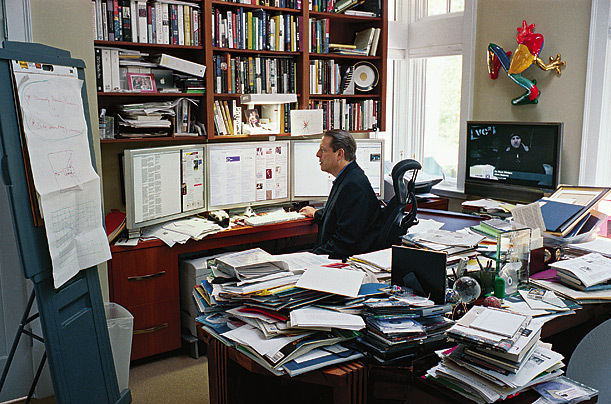 The real reason for the Apple iMac being there has nothing to do with OSX, however. 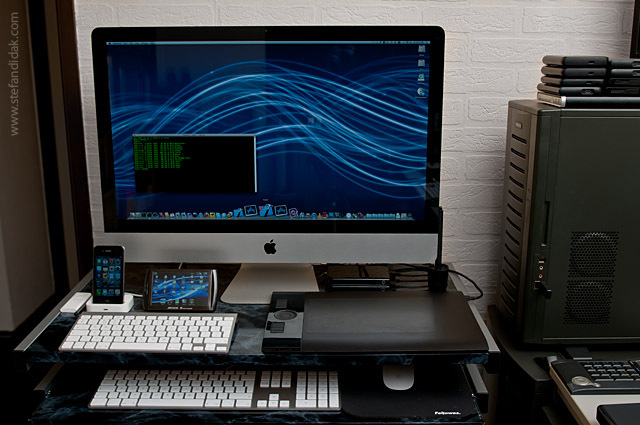 The Mac stuff was a requirement for doing iOS (iPhone and iPad) related development work. However, with the nice resolution on the 27″ iMac I decided to hook the Wacom Intuos 4 on it for photography related fun. It does, after all, provide a few more pixels than the 24″ screens. The personal library of books. Many for sentimental value because they include me or material I created. The Intel PR440FX dual Pentium-Pro motherboard with a ‘whopping’ 256MB ECC RAM. 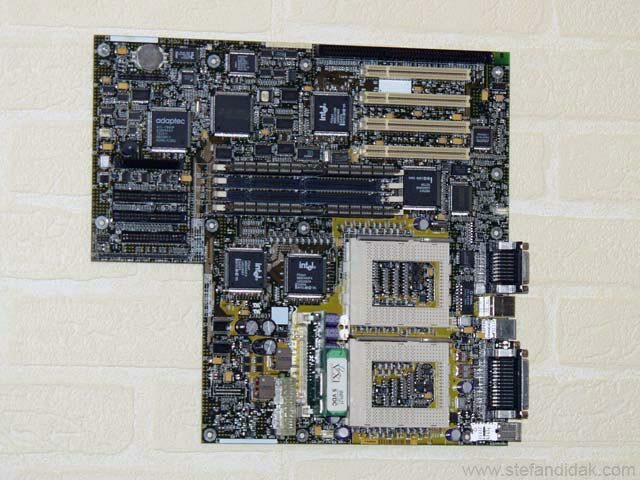 Back in 1995 this was one of the most powerful SMP workstation boards. 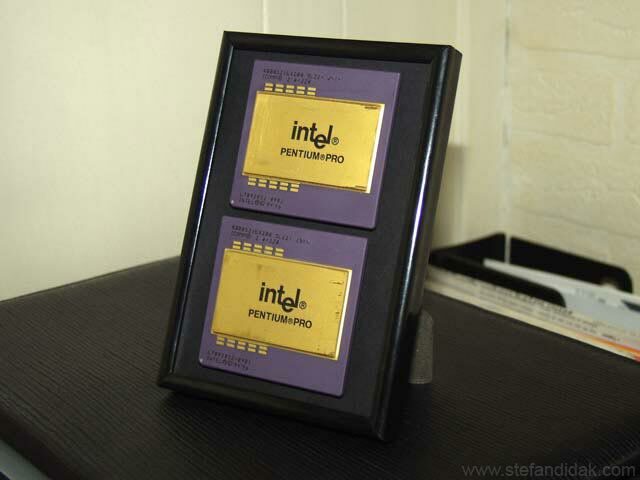 The two Pentium-Pro CPUs that once graced the motherboard above. 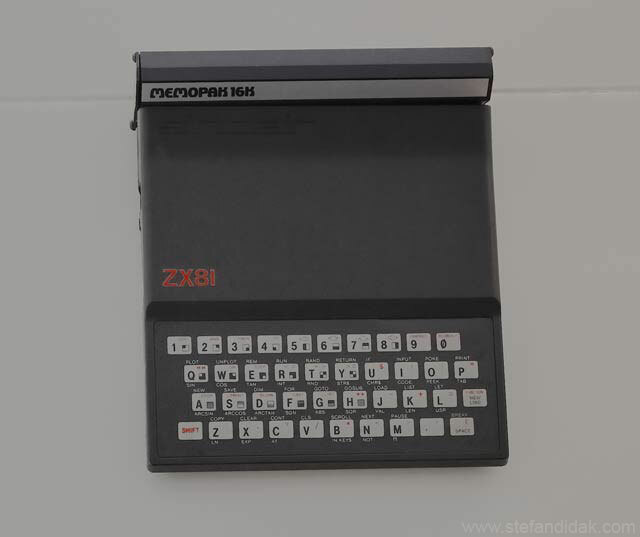 Yes, that’s a Sinclair ZX-81 (anno 1981) with a 16KB memory expansion pack. I’ve saved it all those years and now it’s on the wall. 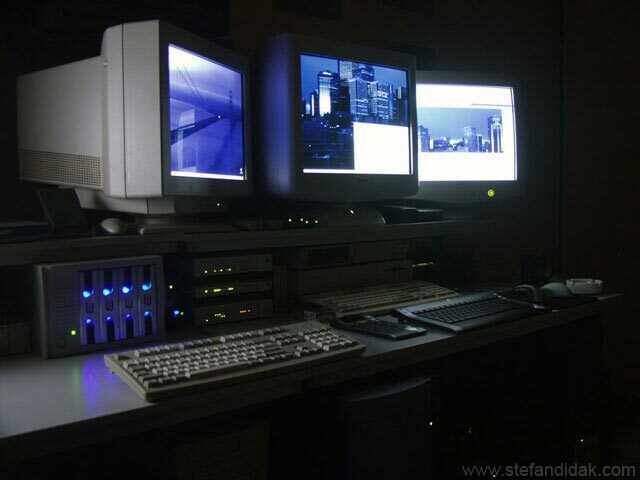 How the desktop used to look before switching to TFT screens and overhauling the office.